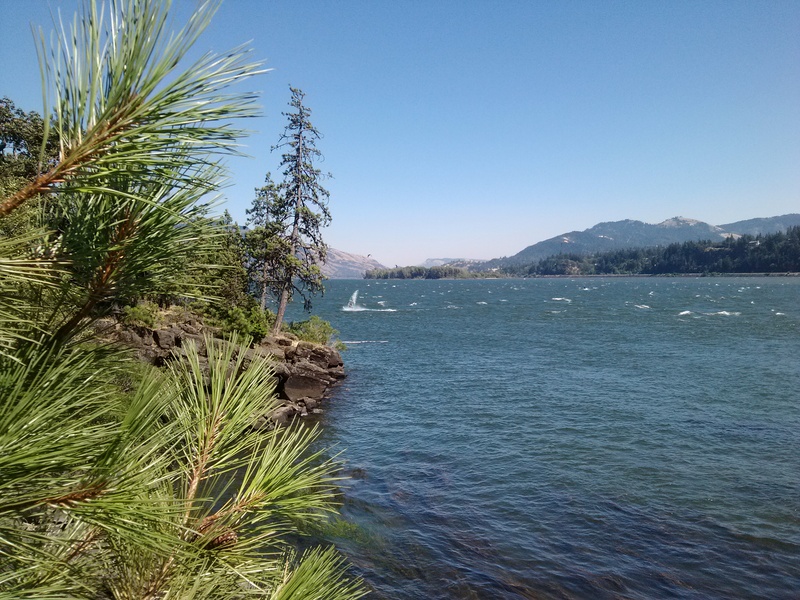 When I thought of the Pacific Northwest, I knew that the natural beauty of Washington and Oregon would blow me away, having already visited Portland, Spokane, Longview and the California coast and seen the unspoiled loveliness everywhere I turned. But it wasn’t until I was actually there in Washington that I realized – yet again – that so much is beyond description, and photographs don’t do the beauty justice. 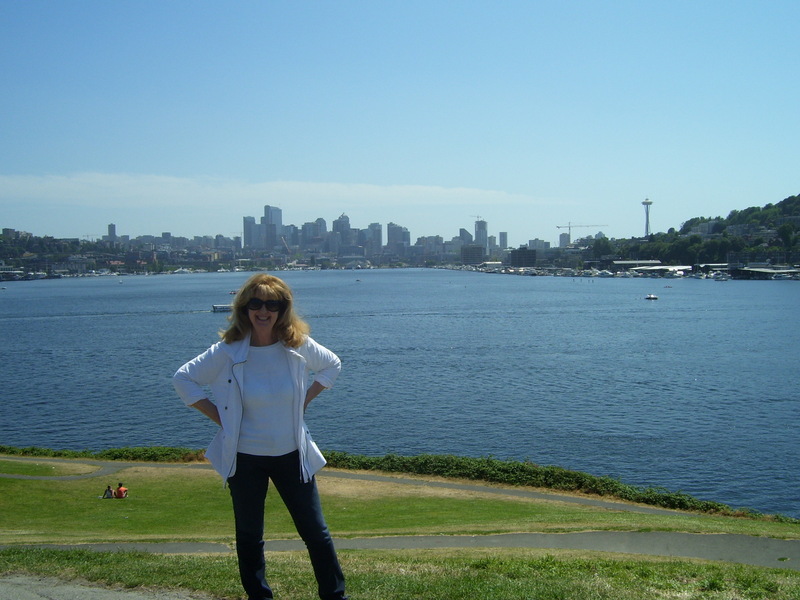 Still, I was lucky to have two friends – who live in the tiny town of Mukilteo just outside of Seattle – to put me up and take me to some incredible places. I spent a week with them, wandering and hiking around both Washington State and Oregon…and just having the best time embedded in this magnificent part of the country. The air was crisp and clean and beautifully sunny (I was thrilled not to experience the seemingly ever-present Seattle drizzle) when I landed. My friends picked me up in the late afternoon, and we had fresh salmon for dinner, as well as salmon pate for h’ors d’ouevres. Yum-o! As we ate supper, a marvelous sunset – orange/yellow/turquoise – played out in the view from the front window overlooking Puget Sound. 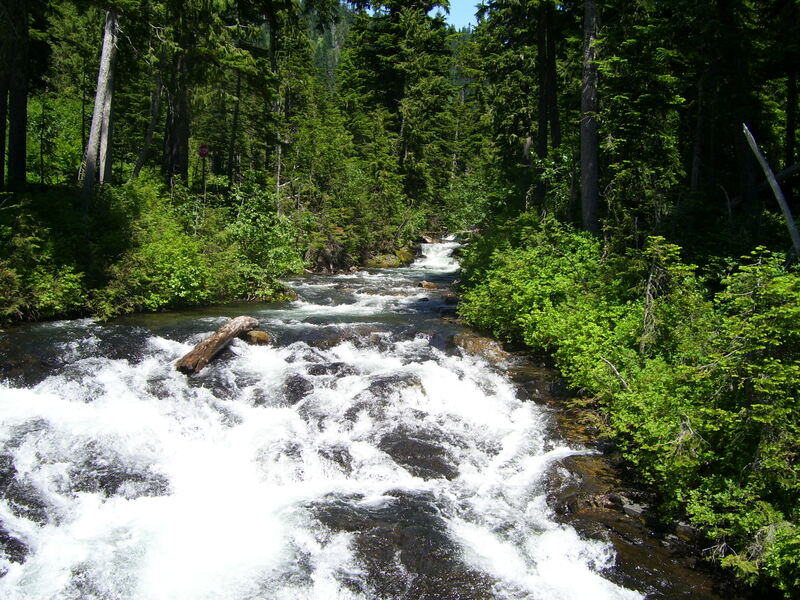 Behind the house rose wooded hills, sewn with redcedar, firs, hemlocks and undergrowth, with salmon streams running through the underbrush. From a high deck attached to the back of the house, we watched a baby eagle which had recently hatched, and every morning could view its attempts to fly the nest, and hear its rough cries as it eased its way into the air. We spent this morning catching up over an early lunch at a terrific waterfront restaurant called Ivar’s. It was great being with old friends, looking out over the water and talking. The food was just about perfect – the best thing being those sourdough rolls. I’d love to be able to get my hands on those rolls in Houston! And the weather continued sunny and bright. 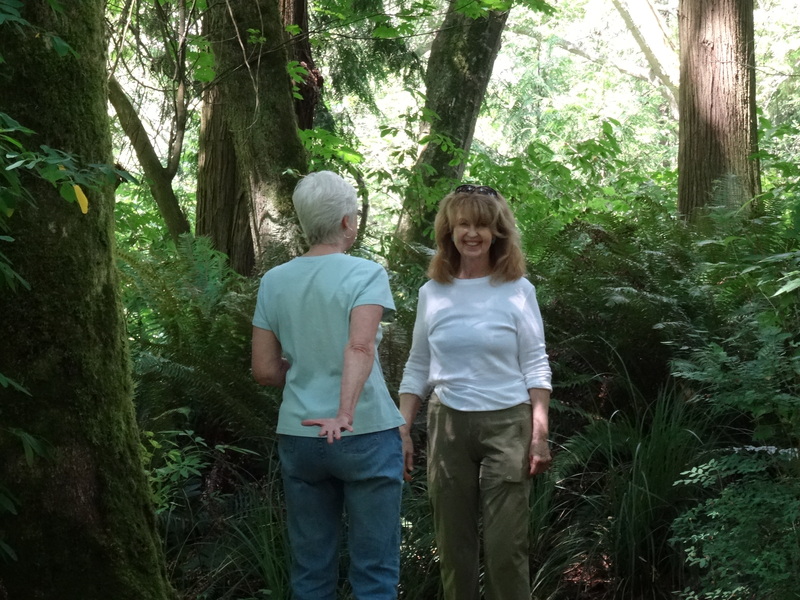 After lunch, we walked the back hills of Mukilteo, up and around the house. 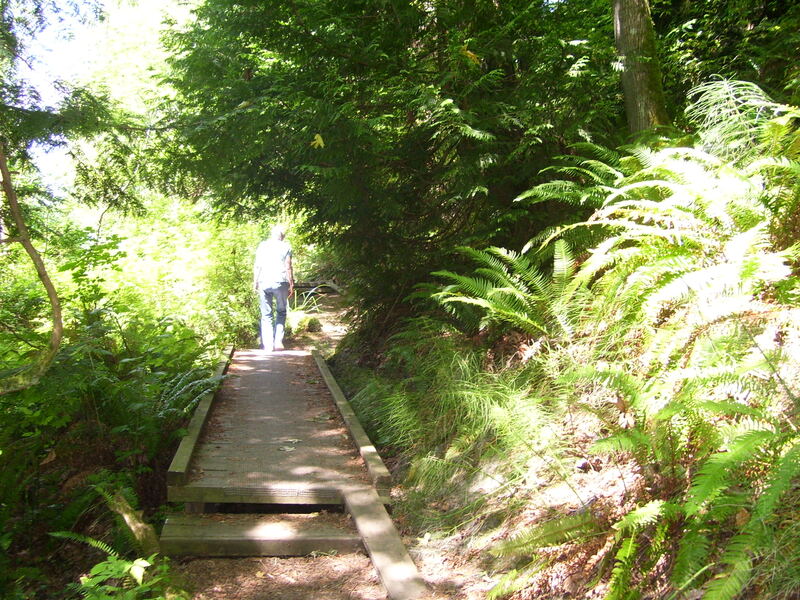 One of the trails took us through Japanese Gulch, so-called due to the encampment of Japanese laborers who lived there until the 1930s. 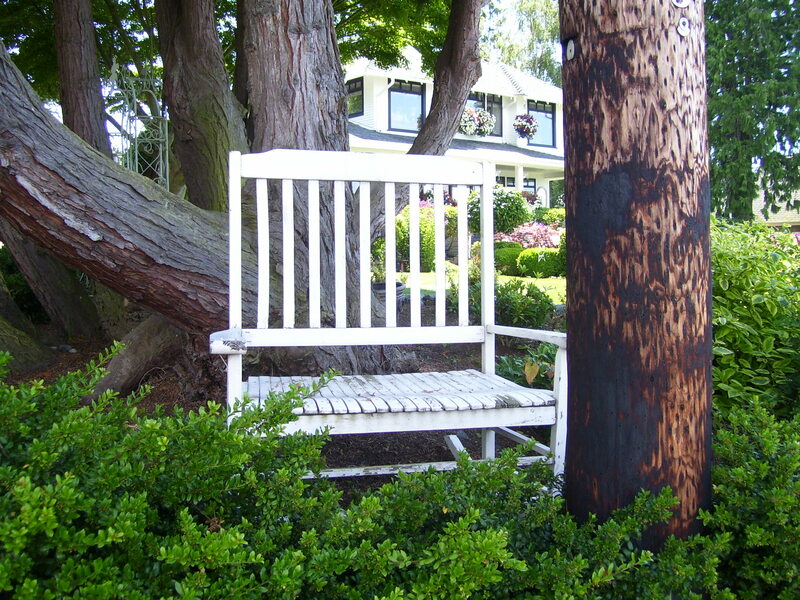 They cut timber for the lumber company in Mukilteo back then. 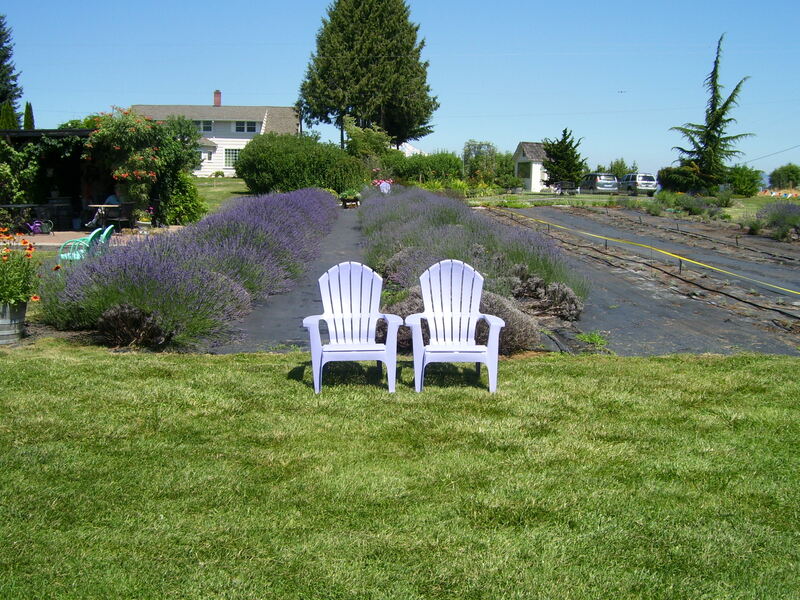 Mukilteo is a short drive from Seattle, and is full of charm and picturesque appeal. The architecture throughout is very varied, from small cottages on up to larger stately homes, with green and colorful landscapes. 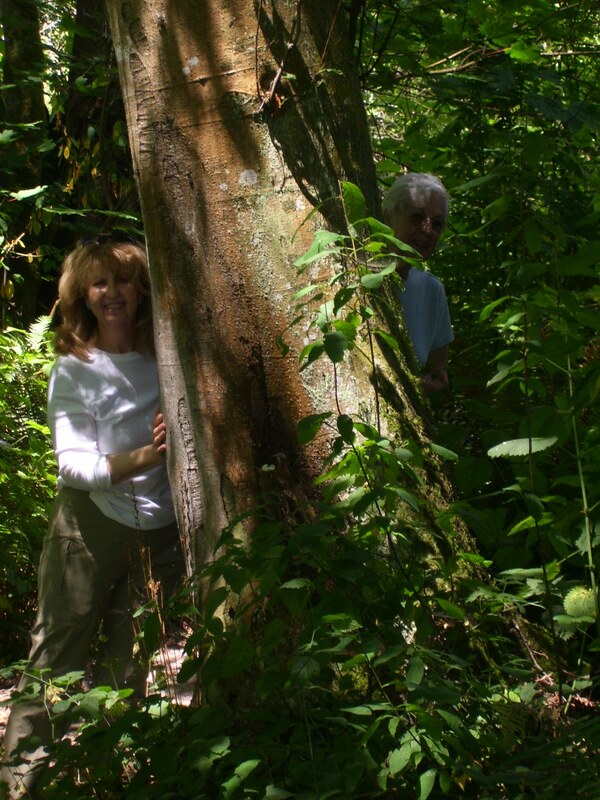 Our walk encompassed a brief trek on a footpath through the woods – along the high road looking to the sea. Down the hill to Mukilteo town, we wandered around – ending up in a pub called Diamond Knot Brewhouse – for an IPA (beer) and a chat. Loved the rustic setting, the laid back appeal of it. The weather continued to be fabulous. 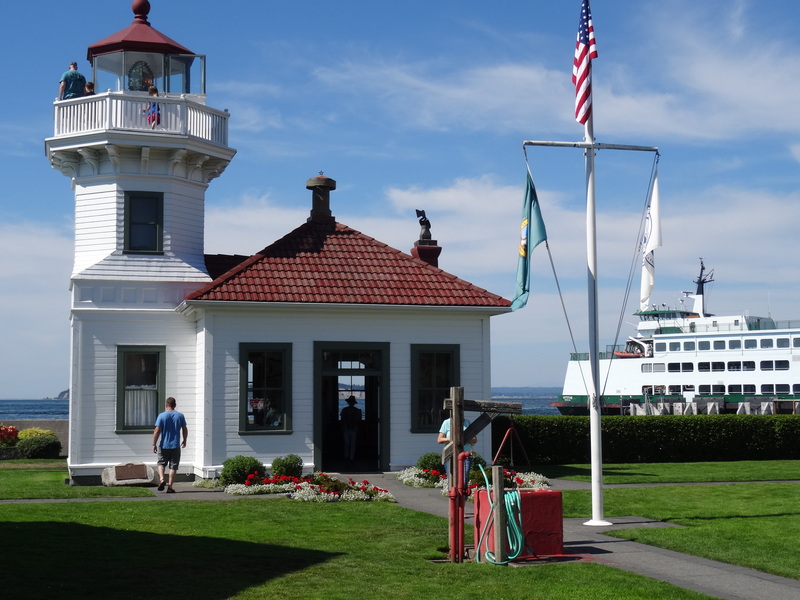 Afterwards, we walked to the Mukilteo lighthouse, a small white building, full of history. We wandered around taking pictures, then home for dinner. Up early and on the road for Whidbey Island. 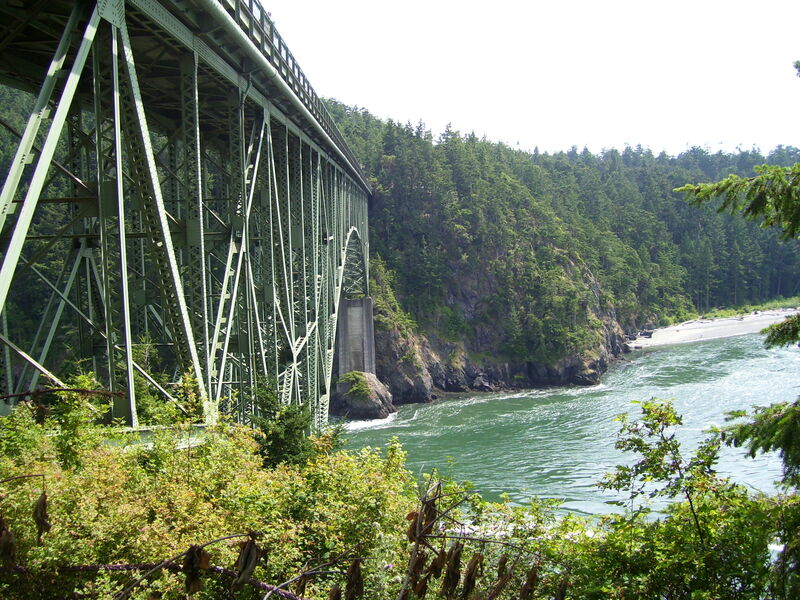 On the Whidbey Loop, we started at the top of Fidalgo Island, then crossed the Deception Pass Bridge to the 88-mile long island itself. 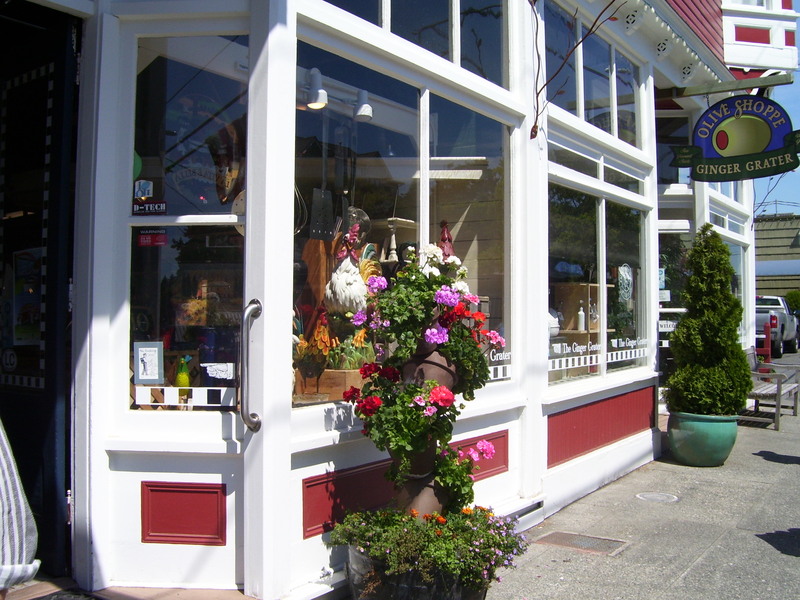 We had lunch at Toby’s Tavern in Coupeville, and it was, of course, terrific…then meandered around the shops and galleries for an hour. 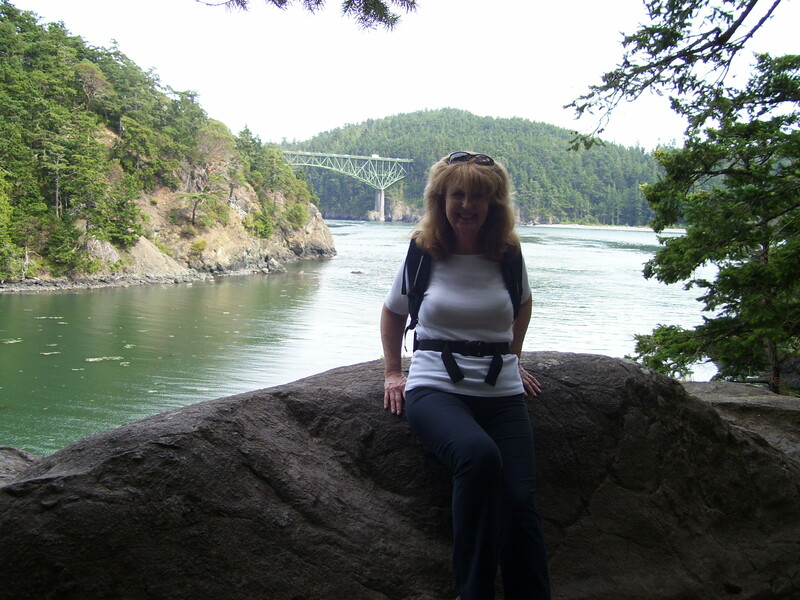 Deception Pass State Park was another stop for a low-key hour-long hike around its lake. 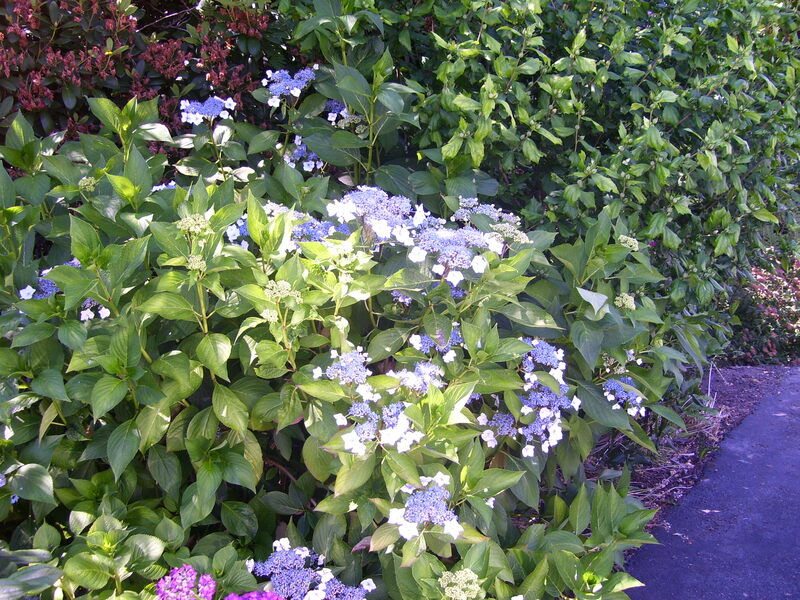 The trail was overhung with a wide variety of greenery, and small flowers poked stems from the undergrowth. The air smelled of green growing things and dead leaves underfoot. After which we ended up in a waterfront restaurant – the waitresses seem to have been there since the beginning of time…what else but fish, chips, and an icy Guinness. Well, okay: we did have fresh shrimp cocktails to start! And then it was the drive back to the big white Whidbey Island ferry, waiting waiting for boarding…. 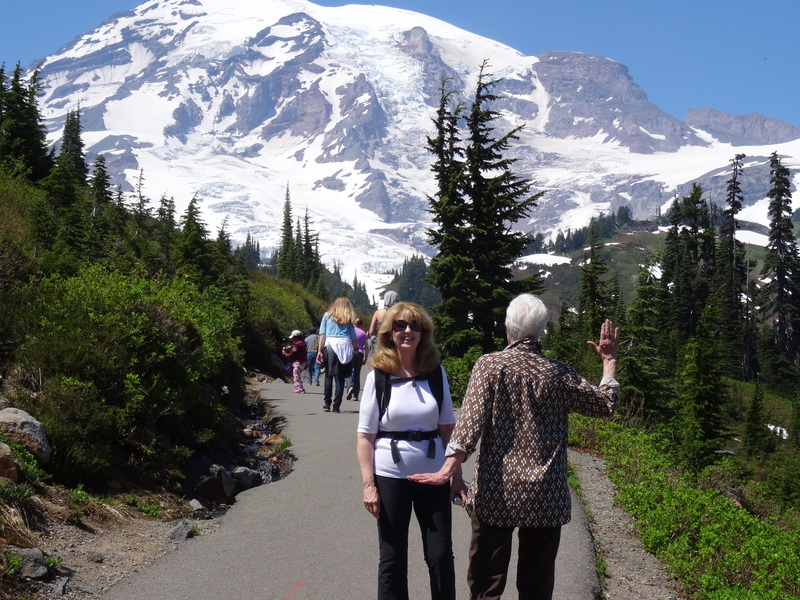 On our merry way to Mount Rainier. 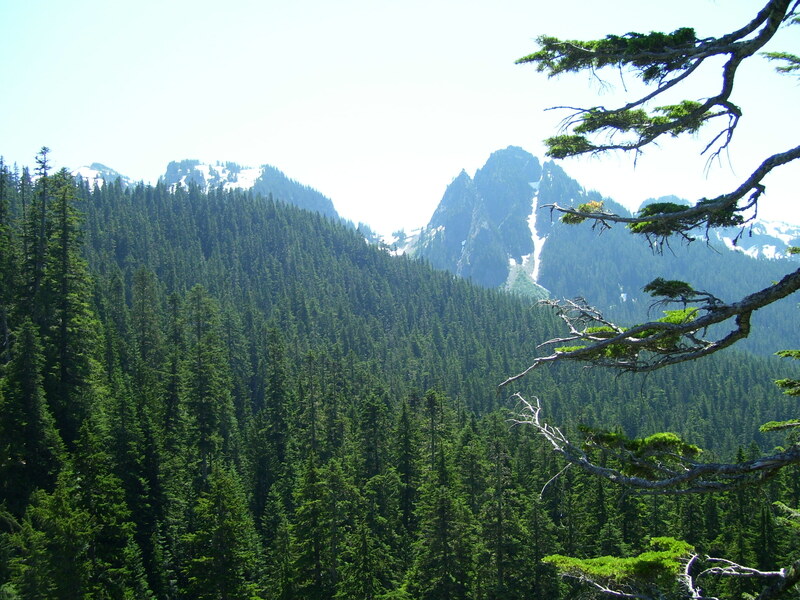 The drive took us through incredibly green and beautiful forests of fir – up to Paradise Lodge. Waterfalls, lakes, mountain views – we couldn’t stop taking photographs – because everywhere you looked, it was spectacular – glamorous – astonishing; no adjective seemed to do it justice. The lakes were an unbelievably clear and beautiful glacier blue-green – the product of melting glaciers, and so icy cold, hypothermia would set in in seconds should you be unlucky enough to fall in. 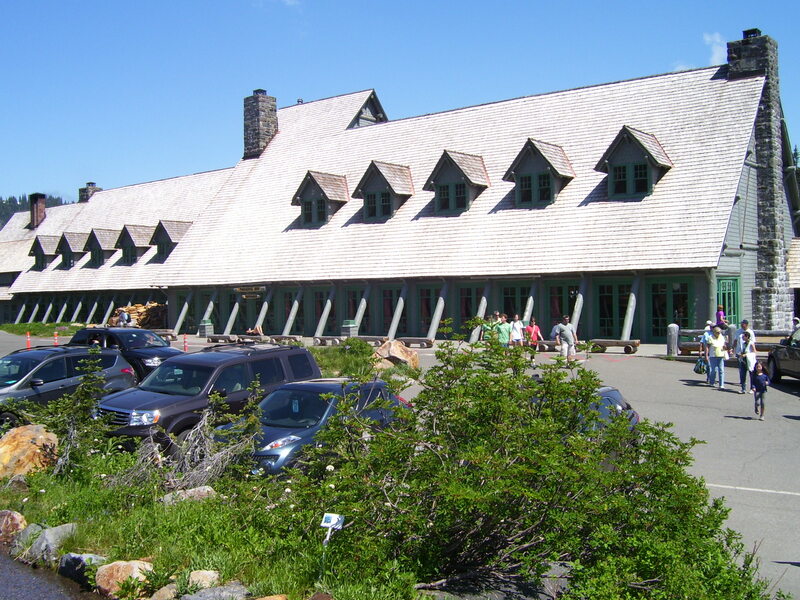 At Paradise Lodge, we dumped our luggage and immediately headed for the trails. 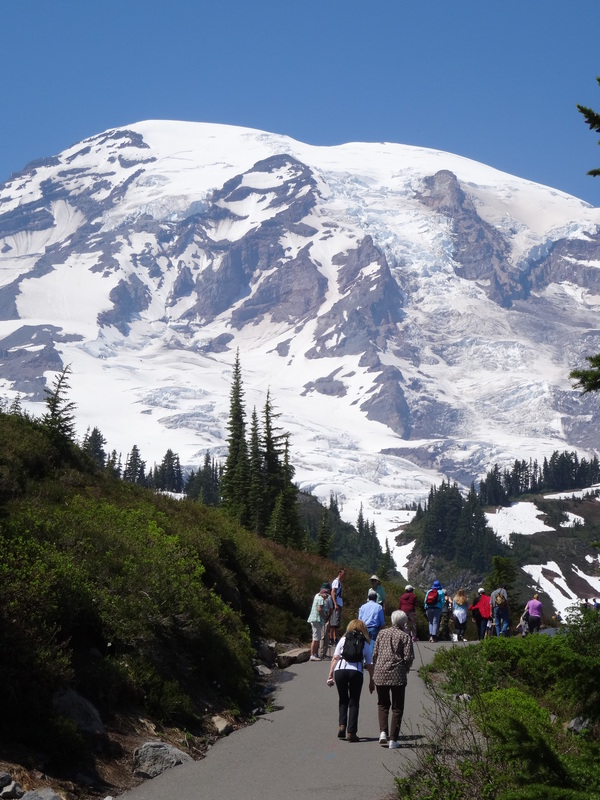 Mount Rainier and the surrounding Cascades, as well as the areas around the Lodge, were covered with snow. The temperature was warm, but the snow – while melting – was packed to the ground. 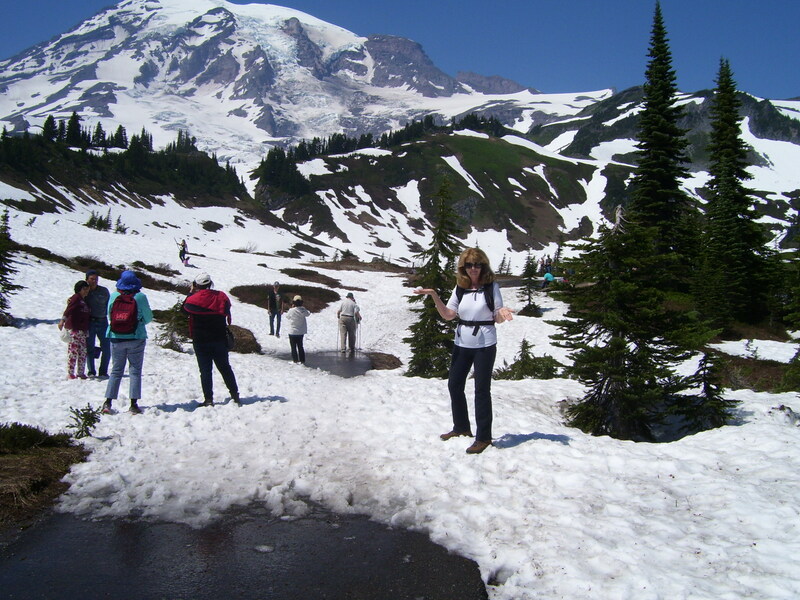 Another magical experience – hiking in the snow – in July!! 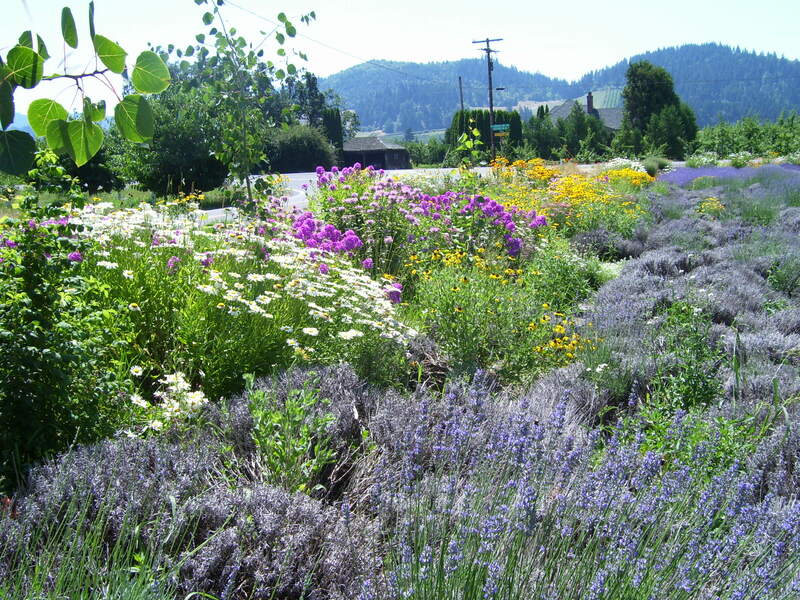 The late thaw had prevented wildflowers from blooming as profusely in the surrounding Alpine valleys. Up around 8AM, and down to breakfast at 9. Another lovely day. 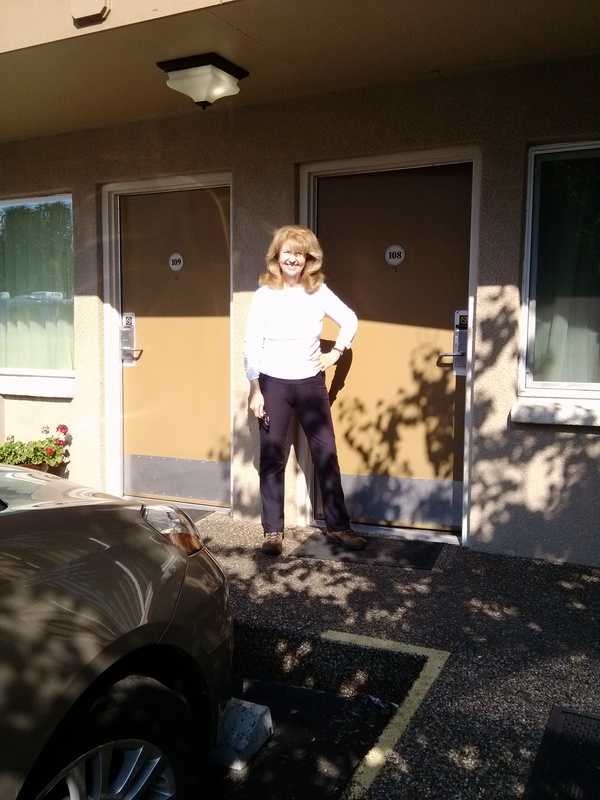 We left the Lodge at 9:30 to begin the drive to the Columbia River Gorge. 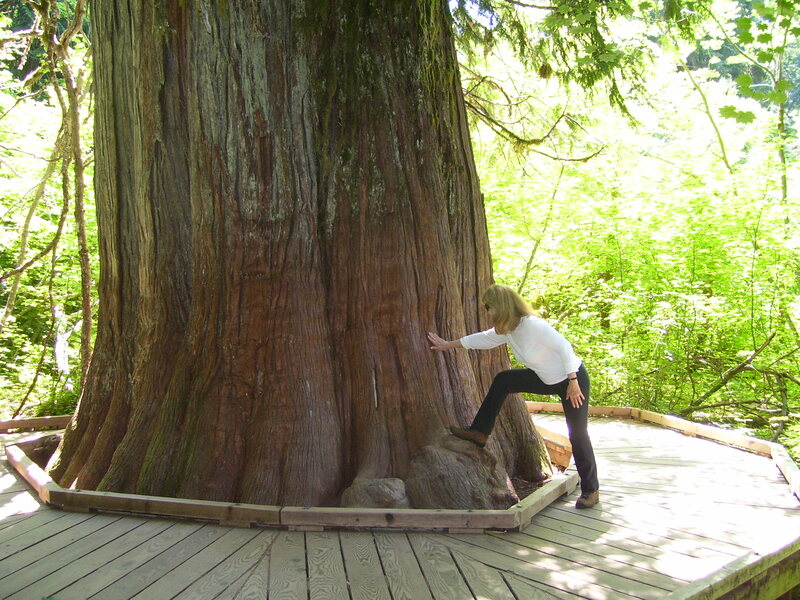 Passing through the spectacular forests, we came to the Grove of the Patriarchs – which housed trees of immense, almost infinite girth (redcedar) and hemlock, Douglas firs, and others. 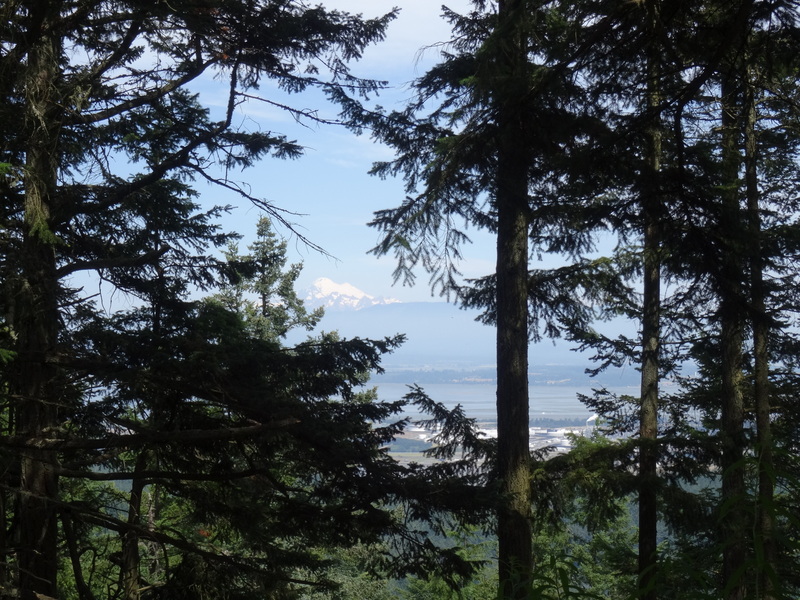 Here we stopped for a hike around the Grove’s perimeter and across a short, rather wobbly suspension bridge. The weather continued warm and sunny. It was difficult not to take a hundred photographs of the imposing trees on this trail, giants bathed in golden light. Getting back in the van, we drove steadily down, eventually coming to rolling hills covered in golden grass, stretching for miles (very similar to when I entered California from the desert many years back.) We stopped for our regular Starbucks break – then another quick stop and ramble at the Maryhill Museum, seemingly in the middle of nowhere. 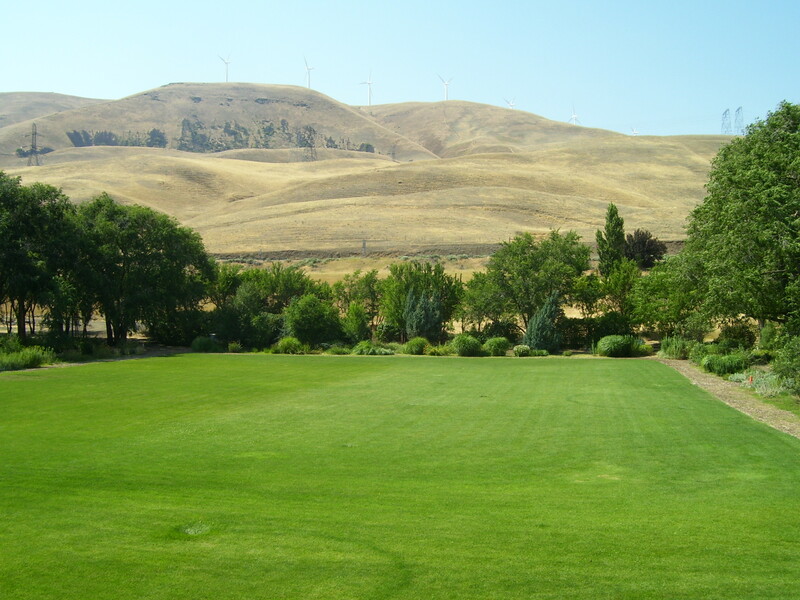 It was surrounded by velvety green lawns, neon-green in the middle of the desert! 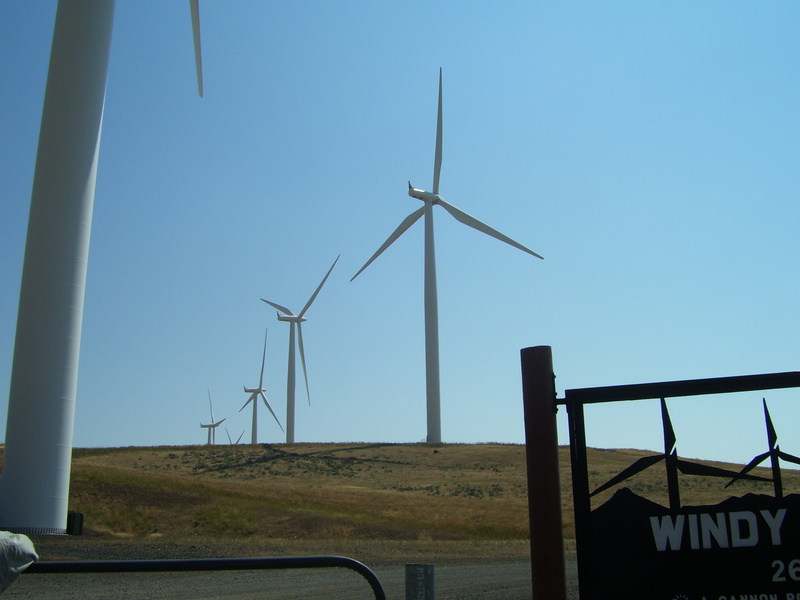 We also pulled over at the Windy Flats wind farm to view the miles of windmills that ranged across the golden hills, making the landscape a dream from a sci-fi movie. 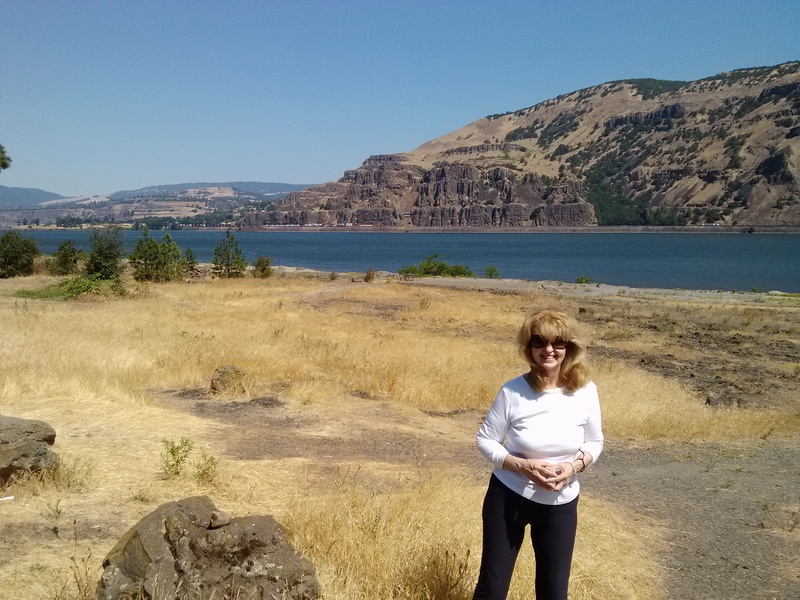 And so we came to The Dalles – which was our destination and stop for the night. 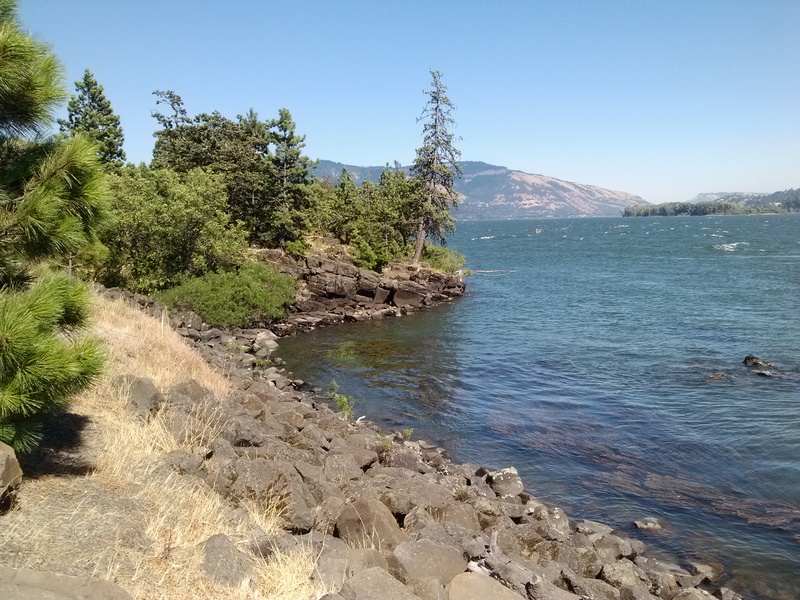 I called The Dalles the “back-of-beyond” – which I absolutely loved. Somewhere further from a New York or even Houston is hard to imagine. ..so you felt very relaxed and isolated – all in all, not a bad way to feel on vacation. After checking into The Dalles Inn and having a bit of a tidy up, we headed for the Baldwin Saloon, an old restaurant with the aura of time-gone-by – delicious food – terrific waiters. Fabulous dinner: Halibut Parmesan, preceded by oysters on the halfshell… It was a two-beer night, so a good time was had by all! Up around 7:30, and off about 9:30. This part of our rambles took us to the Fruit Loop, a scenic drive looping through farm country: orchards filled with ripened apples, peaches, pears – little farm shops interspersed throughout the countryside. 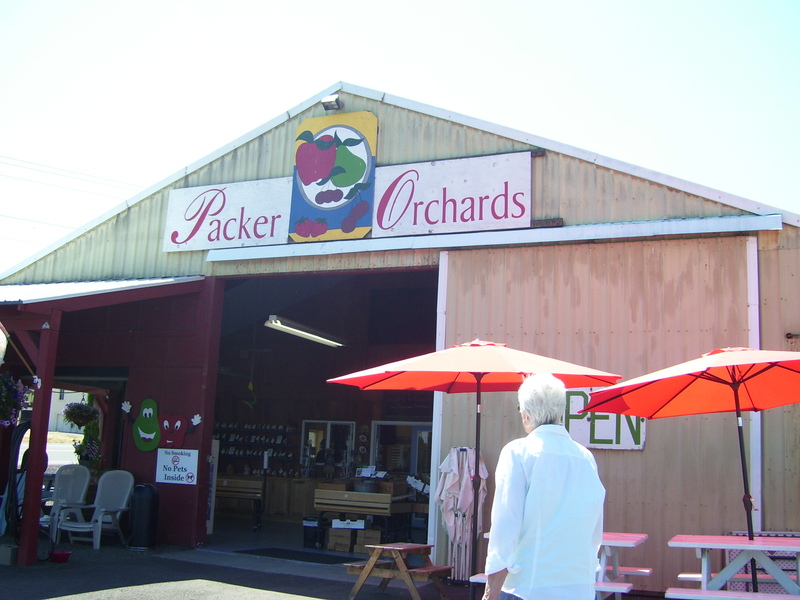 Our first stop was the Packer Orchards, which offered all sorts of fresh fruit from their orchards, and fresh fruit pies baked on site. The scent of the baking pies was…well, delectable, to not put too strong a word on it! And peaches right off the tree – is there a sweeter aroma?! 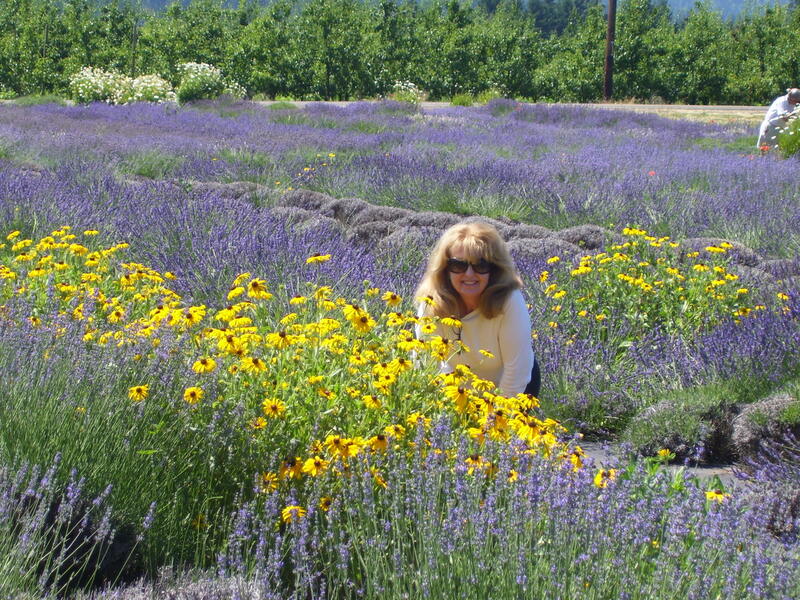 The next stop was the absolutely heavenly Lavendar Farm (my favorite scent) – fields of lavender, interspersed with lupins, yellow and orange poppies, brilliant white daisies, roses galore…and more. The hum and drone and buzz of the bees in the lavender – the warmth of the sun – and the mingled scent of lavender and roses was enough to make you think you had died and gone to heaven. Drowning in lavender – and liking it! 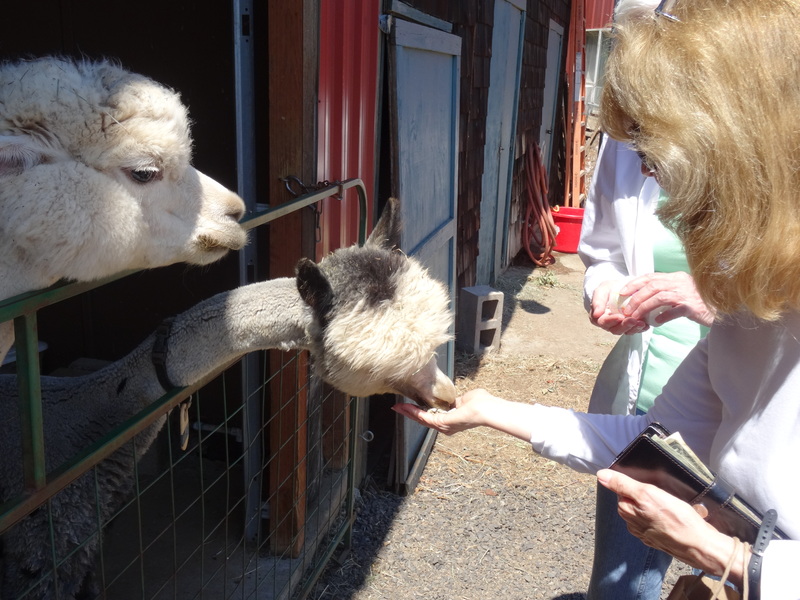 After this, we stopped at an alpaca farm –the little faces of the alpacas made you want to kiss every nose! We hand-fed them grain, and they nuzzled up to us with no fear. You could put your hand in a bag of alpaca fur in the little shop on the premises…and it was like dipping your fingers into clouds. The next leg of the drive took us to Hood River for lunch – a really great taco salad at Betty’s Diner. 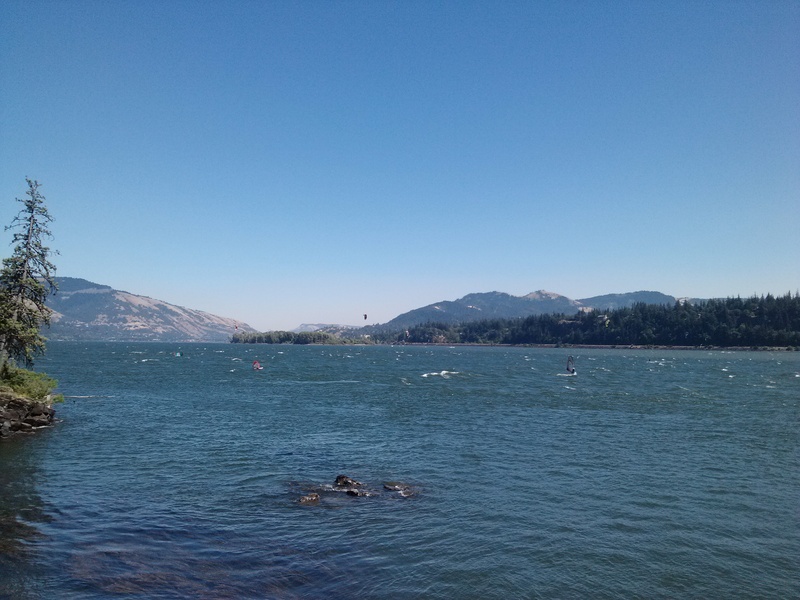 We left Oregon, driving along the Columbia River, stopping to watch the wind surfers glide and fly across the river’s icy blue waters. So agile and so other-worldly against the intense blue of sky and water. Surrounded by the wonder of nature, you had a moment of “why anyone would want to be anywhere else?” Of course, in the depths of mid-winter, not quite so appealing! But at this time of year, it could not be more magical. We arrived back in Mukilteo, put our feet up, ate salmon pate and enjoyed the fabulous sunset over Puget Sound (more specifically, Possession Sound). The sunsets have been exquisite – dusky Tuscan yellows and oranges, aquamarine blue fading to deep indigo. Left early for brunch at Ivar’s – fish taco, which I’d never had. Yum-o! Again, Ivar’s has the absolute best sourdough rolls I’ve ever tasted. Wish I could buy them in Houston! Then we took off for a jaunt around Seattle. 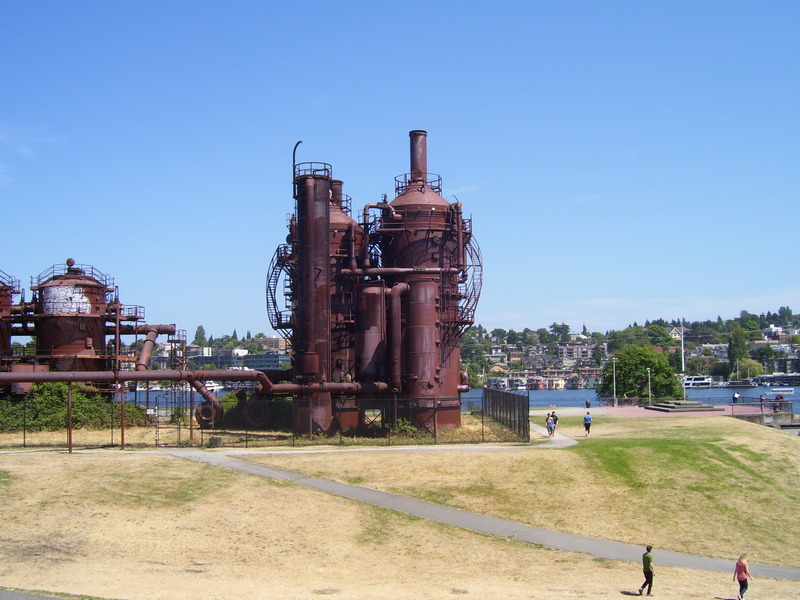 Our first stop was the Gasworks Park – an old gasworks, rusting and left in place overlooking Elliott Bay. We stopped for a photo opp, but really just to take in the view across the water. 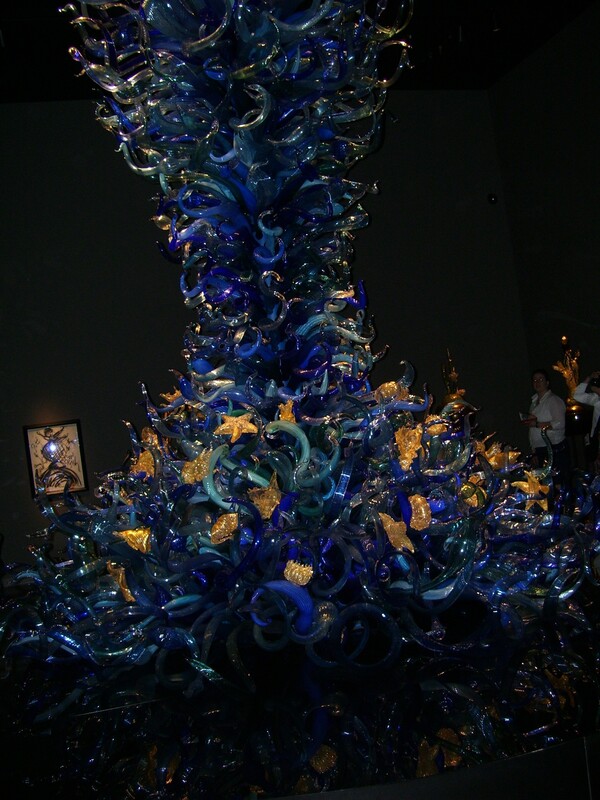 After which, we drove through the University of Washington, then on to the Chihuley Exhibit – an incredible museum of brilliantly colored glass sculptures – neon green, red, purple, yellow – some pieces like the tentacles of some mythic sea monster, others interpretations of undersea foliage – and still others evocative of the sculptor’s mother’s garden! 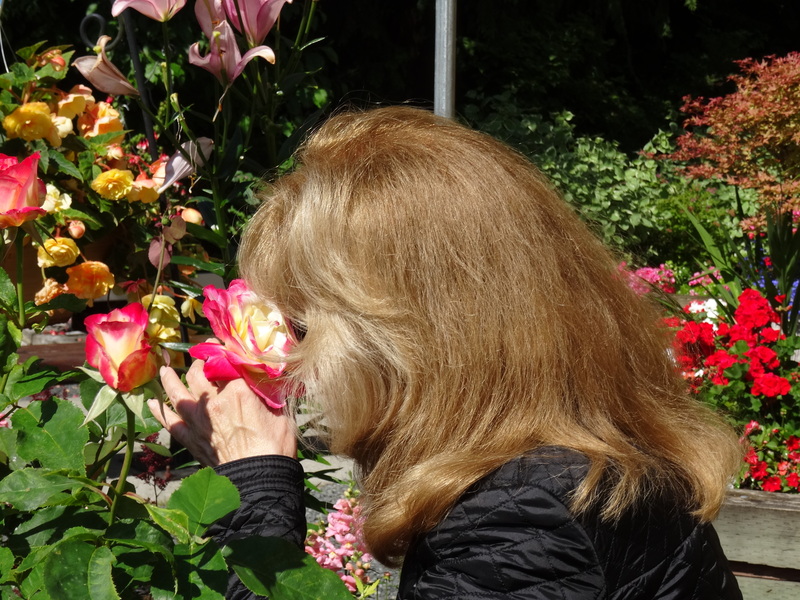 For me, after seeing the natural beauty of the state, glass sculptures of flowers and gardens couldn’t begin to compare. But the sculptor did produce some brilliant creations. 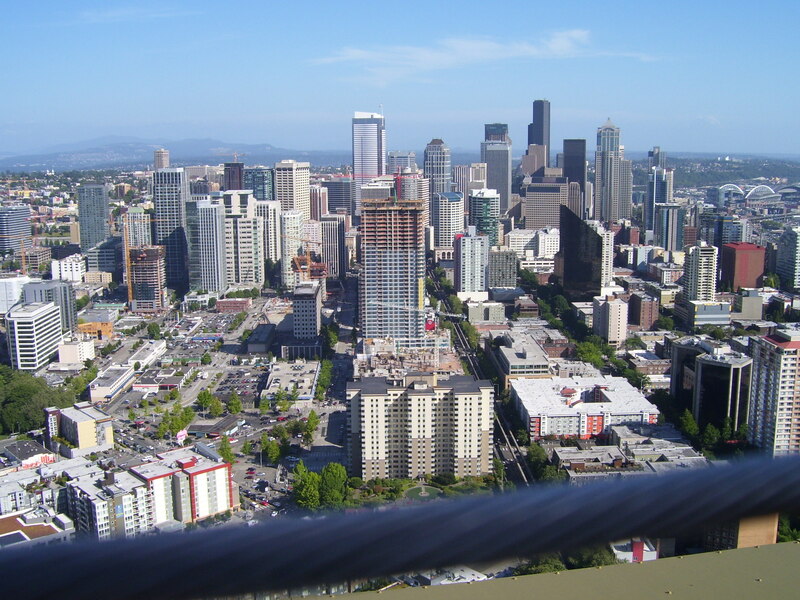 This was followed by the Space Needle for a 360o view of Seattle. After a rather overcast morning, the sun had broken through the clouds and cleared the mist, and all was merry and bright. 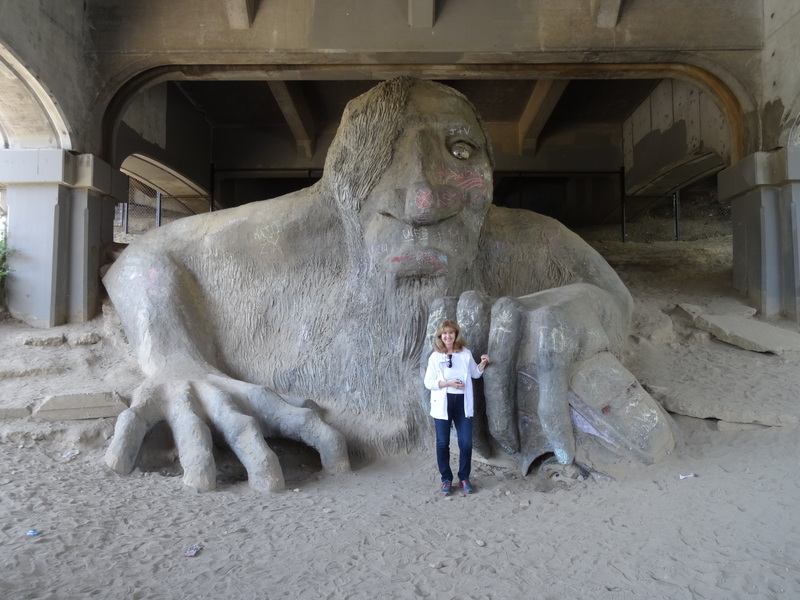 We also made a quick stop to view “The Troll Beneath the Bridge” – a wonderfully eerie sculpture – which unfortunately had been graffiti’d all over, making his expression particularly doleful. 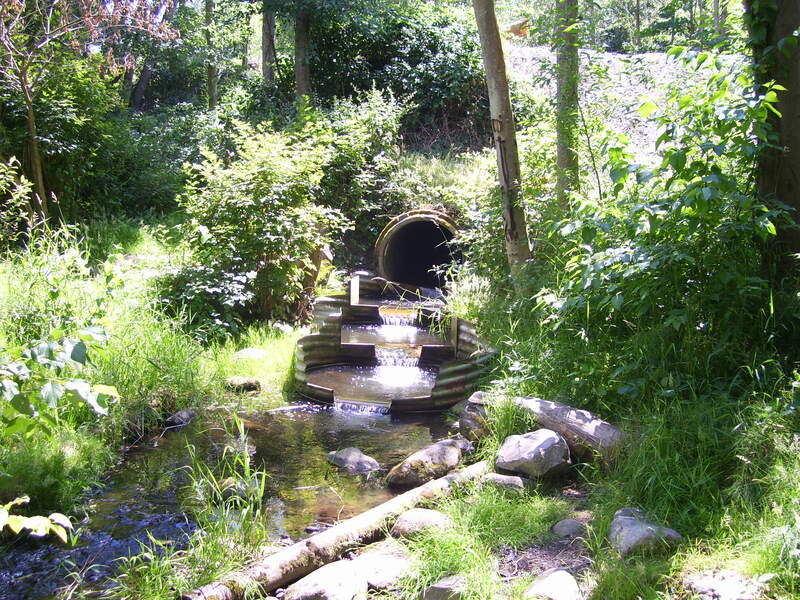 The Troll Beneath the Bridge – and me! 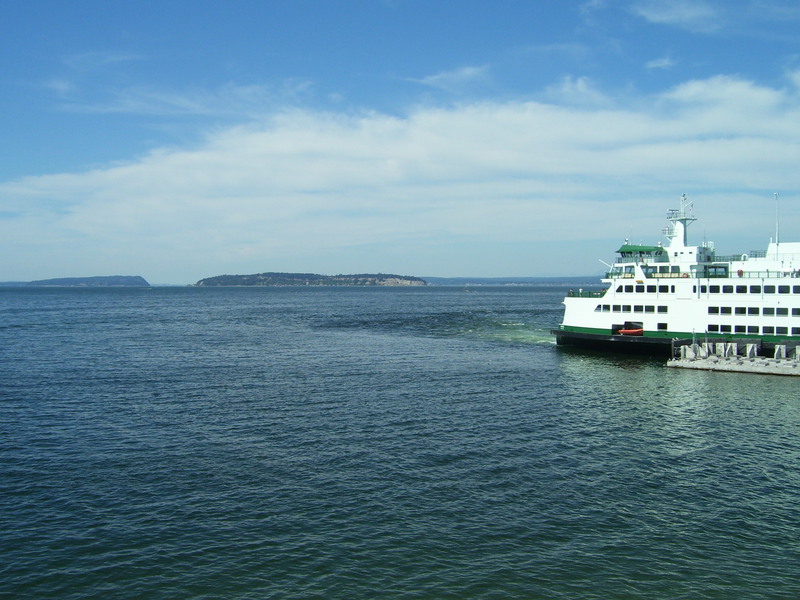 We came back to Mukilteo through a crush of cars – no matter which way we turned, the traffic was incredibly bad. We managed to finally break through the stalemate and landed back at the Diamond Knot Brewhouse on the shores of Mukilteo. 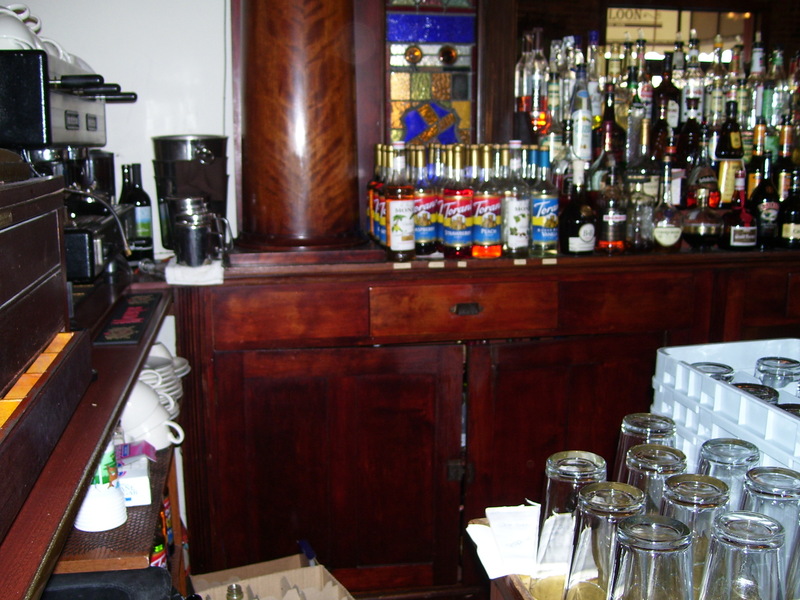 Nothing like a laid-back pub at the end of a busy day…and a Guinness to boot! Then it was time to pack for the flight home Friday, and think about everything I’d seen and experienced. 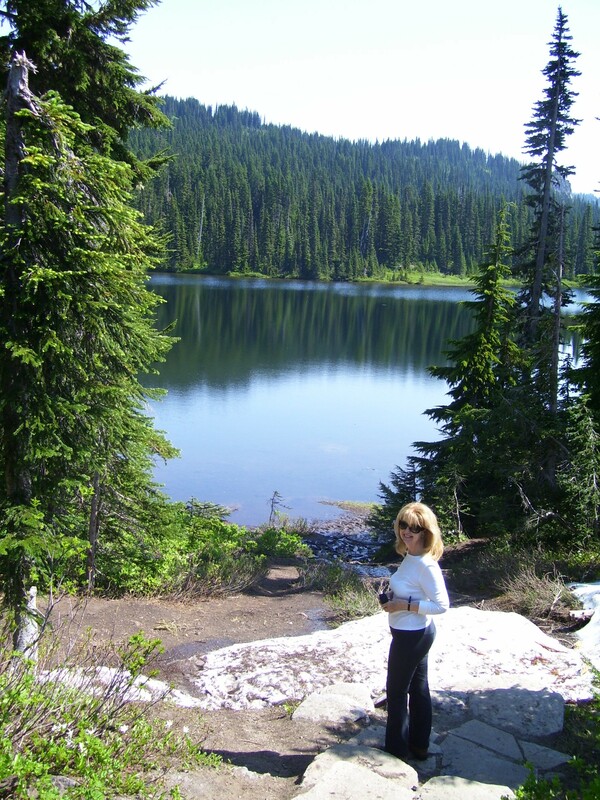 The Pacific Northwest – and all other natural beauty – should be protected like the jewels they are. I always am so grateful for such unspoiled loveliness… and equally grateful at how good it is to be able to experience it in the here and now. 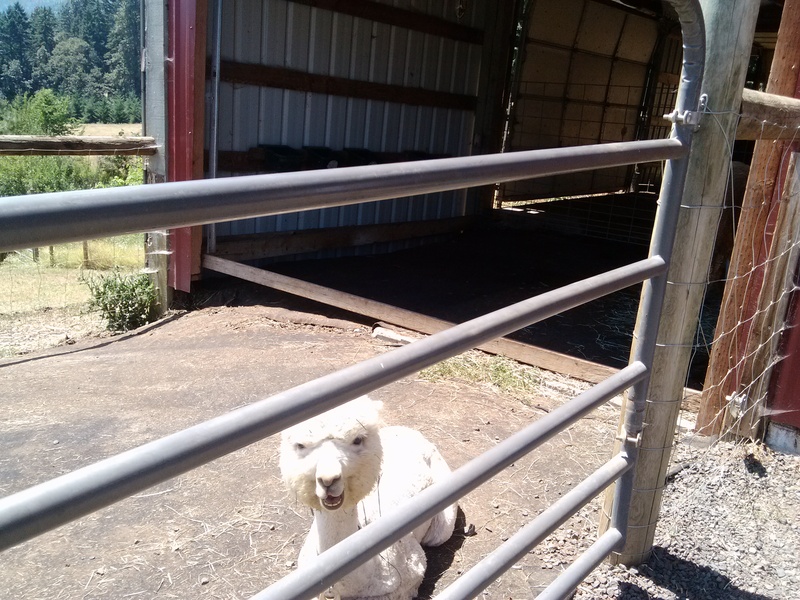 Posted in Uncategorized and tagged alpaca farm, alpaca fur, alpacas, Baldwin Saloon, California, Cascades, Chihuley Exhibit, Columbia River, Columbia River Gorge, Deception Pass, Deception Pass State Park, desert, Douglas firs, Fruit Loop, Gasworks Park, glacier, golden grass, Grove of the Patriarchs, Guinness, hemlock, Hood River, Ivar's, lavendar, lavendar farm, lupins, Maryhill Museum, Mount Rainier, Mukilteo, Natural Beauty. The Great Pacific Northwest, orange poppies, Oregon, Oregon and Washington State - the Great Pacific Northwest, Pacific Northwest, Packer Orchards, Paradise Lodge, peaches, Possession Sound, Puget Sound, redcedar, roses, salmon pate, Seattle, Space Needle, Starbucks, suspension bridge, The Dalles, The Dalles Inn, The Troll Beneath the Bridge, Washington, waterfalls, Whidbey Island, Whidbey Island ferry, white daisies, wildflowers, wind farm, Windy Flats, yellow poppies. Bookmark the permalink. I was born in England...and moved to Wales when I was two years old...to a small fishing village called The Mumbles, just down the railroad track from Swansea, along the sea. Back in the day, this village was everything you'd want to live in as a kid...surrounded by the sea and the mountains, cliffs and fields full of buttercups, hedgerows high and filled with brambly scrambling vines and flowers...Red currants and peas from village vegetable gardens were plentiful, and we were able to play among the sheep wandering everywhere. The green of the fields was intense. We left Wales to come to Houston, the other side of the world and not QUITE as green, and since then I've travelled more or less constantly...later in life I took up hiking, when my first hike with a friend took me to the Cornish coast in England. There I was able to walk the causeway from Marazion to Mount St. Michael, visit Mousehole where my mother was born, and return to The Mumbles decades after I first lived there. Cornwall is one of the most beautiful places on the face of the earth...but then, there are so many beautiful places...you have to seize the day, or it passes you by...gone in the wink of an eye. Grace, thank you for that lovely note…it is inspiring me to continue to write…I hope you get to travel the world and experience all its great beauty…again, I appreciate your writing me!! I see something really interesting about your site so I bookmarked. Wow – nice to hear!